#1 in the Jazz Police Speculative Poetry Series. Includes 1990 Rhysling Award-winning long poem. Here we find no versified SF stories; none of Memmott's poems depict generically†typical SF situations. Instead, each poem weaves a language-pattern correspondent to a soul in crisis; here, intersecting and brilliant colored planes of discourse slide past one another in a (speculatively conceived) carnival of existential doubt. In this collection the poet appears as a narrator of the fantastic in the ordinary — of the supremely strange in the apparent normalcy of life in our world... One cannot read these words without apprehending them as genuine ; nor can one understand the thoughts and messages framed by those words as being other than personal and unaffected. "When you feel these poems shake the world Enraging Richter you know you have hold of the epicentaur." 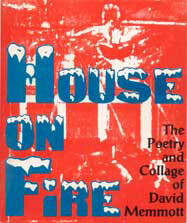 "Employing both crystalline imagery and meticulous craft, House on Fire showers us with such incandescent poems. Cast up by a firestorm of creativity, perhaps, but caught in that moment when the wind chases them across the dark heavens and they fall, each an omen, each an ember of personal mystery that flares before it dies. I found them revealing. Our blood's secrets can be read between Memmott's lines."